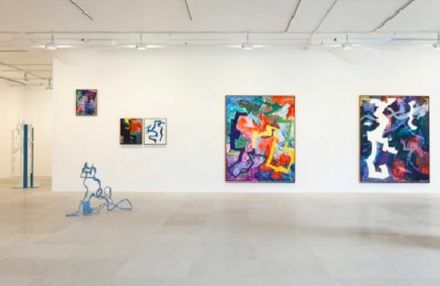 Currently on view at the Greene Naftali Gallery is a solo exhibition by Norwegian artist Ida Ekblad, presenting new works characterized by the combination of lyrical elements in painting, sculpture, and poetry. 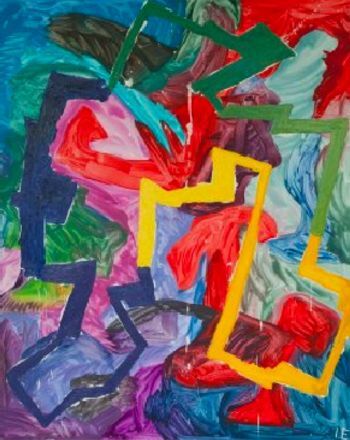 Ekblad’s paintings are comprised of bold colors in twisted, interlocked linear contours, reflecting a strong affinity toward abstract expressionism, while maintaining a distinctly playful spirit. The works appear to be in conversation with the metal wielded sculptures that are placed throughout the gallery. 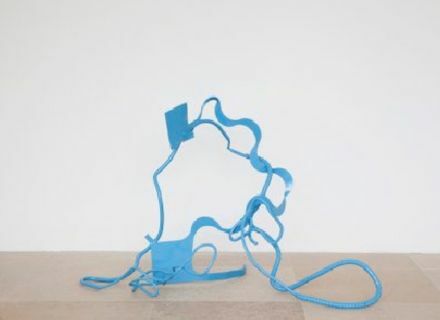 The metal sculptures are assembled from scraps Ekblad has discovered on the streets or in landfills, or often even from the very places she exhibits. While their original form remains relatively untouched in the process of fabrication, she imposes on them her signature vibrant color palate—liberating them from the status of discarded industrial remains and reclaiming them as a reflection of her spontaneous discoveries. In addition to the smaller abstract sculptures, three large gates are placed in the center of the gallery, a striking re-creation of an everyday utilitarian object using a more delicate vocabulary of painted scrap metal. 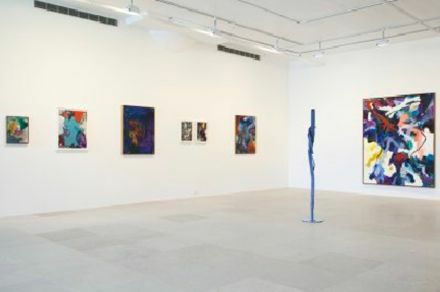 Their placement within a gallery space seems to be an invitation for viewers to allow themselves to engage completely with the surrounding work in order to pass from one state to another. Improvisation and chance play a large role in Ekblad’s creative process. She is often associated with the avant-garde CoBrA movement as her work is an expression in spontaneity of form and language. 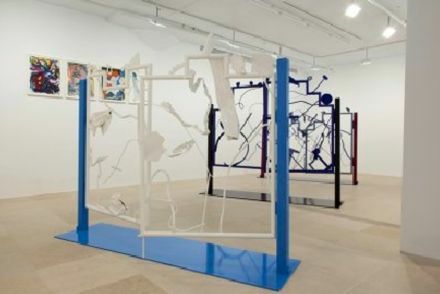 Often connected to writing, Ekblad’s exhibitions regularly include a poem, written by herself or a poet influential to her artwork. 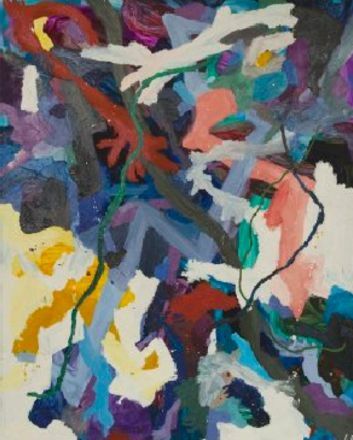 The artist notes in a 2009 interview, “painting to me combines expressions of rhythm, poetry, scent, emotion… It offers ways to articulate the spaces between words…” Indeed, her poetic sensibility translates across every medium in which she operates. 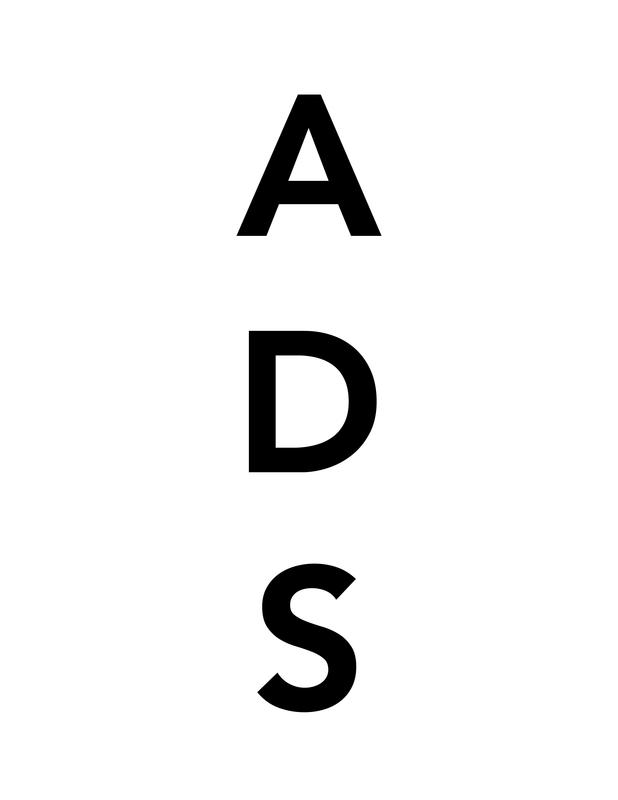 This entry was posted on Tuesday, September 27th, 2011 at 12:31 am	and is filed under Art News, Go See. You can follow any responses to this entry through the RSS 2.0 feed. You can leave a response, or trackback from your own site.